Baader zero-tolerance protective Canon DSLR T2 ring offers the largest aperture possible in order to reduce vignetting and it can also be universally connected thanks to included different types of adapters (it comes with M48, T2, and S52/2" nose adapters). 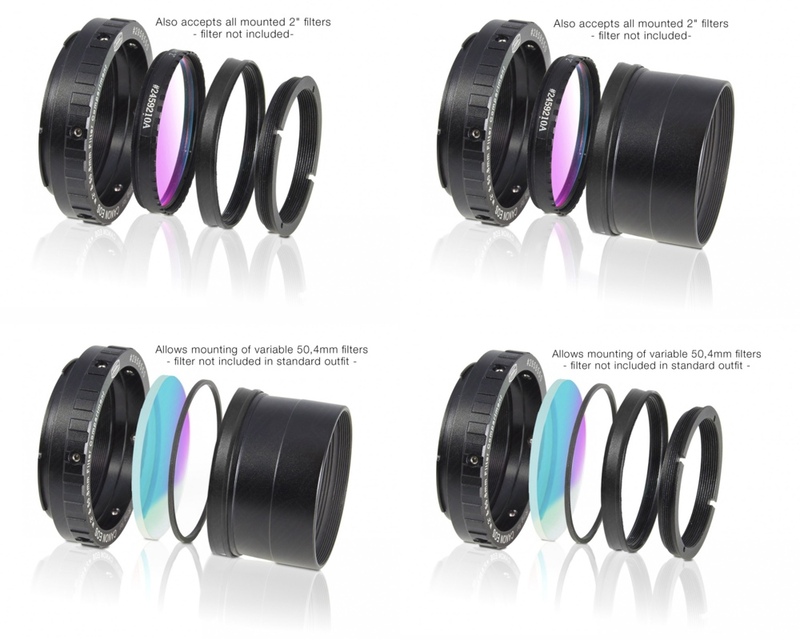 More, you can also insert filters in the T2 ring body, also protecting the camera body from dust and humidity. All unmounted 50.4mm Baader filters and Baader 50,8mm filters mounted in low-profile filter cells (LPFC) may be used with the Protective T-ring. After carefully examining the CANON bayonet fitting, Baader optimized the fit and tolerances between the camera bayonet and T-ring. The result is this zero-tolerance Canon DSLR T2 ring, which is wobblefree and has no lateral play thus always guaranteeing a stable image platform, even for long exposures or when the telescope slews.